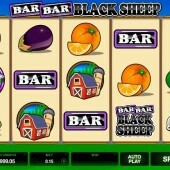 The 5 reel slot Bar Bar Black Sheep is an adaption of an older 3 reel version by the same developer Microgaming. They have taken the classic nursery rhyme Baa Baa Black Sheep and developed a game for adults out of it. Microgaming do have a history of this of thing – anyone who has played slots from the rhyming reels series such as Georgie Porgie or Jack and Jill will be well aware of this. The reels are made up of symbols from the farm, such as corn, melons, oranges, apples, a barn and various sheep icons. There are also scatters, wilds and a special ‘bar’ symbol that is required for a particular feature. 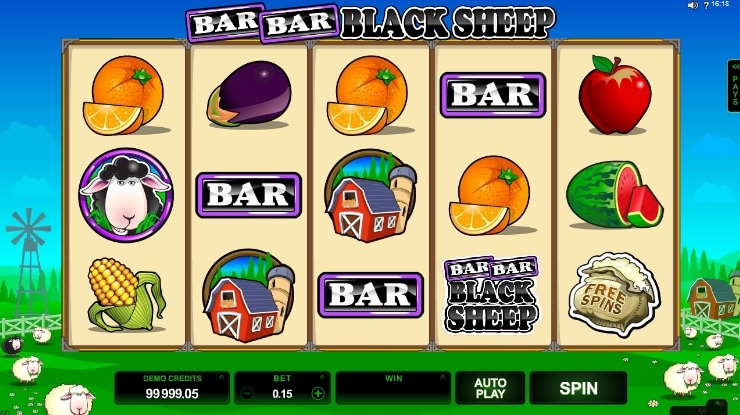 This feature is carried across from the original and requires two ‘bar’ symbols in a row and the black sheep as a third symbol – matching the name of the nursery rhyme. The feature delivers a multiplier that can provide up to 99x your line stake. But this is more easily understood as up to 50x your total stake. Land 3, 4 or 5 free spins icons in the same spin and you will be awarded with between 1- 20 free spins. All wins are multiplied by 3x, apart from when the Bar Bar Black sheep bonus appears. This is probably your best opportunity for any decent wins in this slot, as the opportunities in the main game are limited. I take a fairly dim view on anything in the gambling world that might have even the slightest chance of appealing to children and unfortunately this game falls into that category in my opinion. The game itself is fairly mundane with regular small wins that you would expect with a low volatility slot. Other farm yard slots that are much more entertaining include NetEnt's Tornado Farm Escape or RTG's Triple Twister, so check these out.